This pattern is no longer available through Skacel. I expect to release an updated and reformatted pattern shortly. Please leave a comment if you would like to be notified. 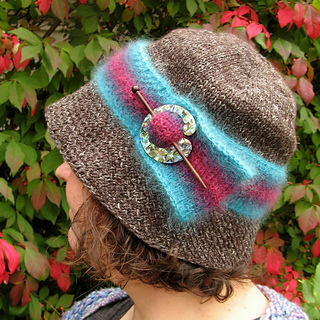 The Carillon Cloche was designed to feature an abalone shawl pin by JUL. 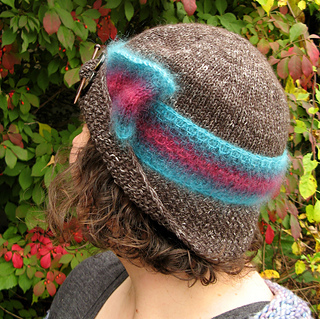 It combines the structure and subdued tweediness of Leinen Los with the soft halo and glorious colors of Kid-Seta. Both yarns are held doubled throughout. 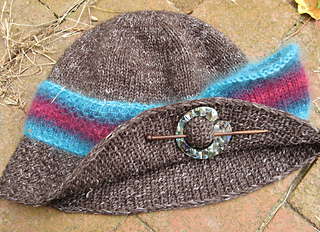 The brim is worked flat, on the bias, in half linen stitch; careful use of increases and decreases allows the brim to naturally form the classic “bell” shape of a cloche. 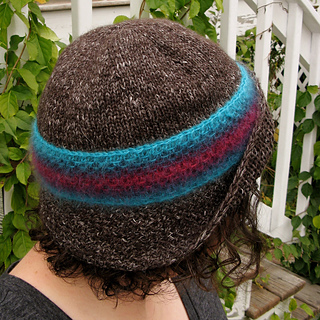 The body is worked in stockinette stitch from picked-up stitches. Thoughtful decreases in the crown ensure a smooth silhouette. 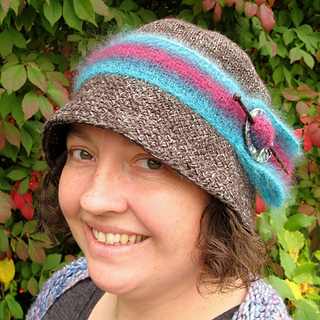 The band is worked flat in half-linen stitch, in four vibrant hues. Choose two light colors and two dark colors for best results. The sample was worked in light turquoise, dark teal, purple, and hot pink. The finished band is sewn in place. My sample used 1.25 balls (about 410 yards) of Leinen Los, and less than 50 yards each of the four different colors of Kid-Seta. CC4), less than 1 ball of each color (yarns held doubled). To save time, check your gauge and read all instructions thoroughly before beginning. 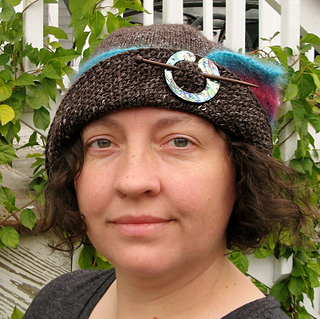 Note: The Brim is worked flat, in a modified Half Linen Stitch (to allow it to curve), the ends are grafted together, then stitches are picked up along the inner curve, and the Body and Crown are worked in the round.